Size-of-transaction threshold under Hart-Scott-Rodino Act will increase to $90 million. On April 3, 2019, revised thresholds for the Hart-Scott-Rodino Antitrust Improvements Act of 1976 (HSR) will take effect. The thresholds determine whether parties involved in proposed mergers, consolidations, or other acquisitions of voting securities, assets, or unincorporated interests must notify the Federal Trade Commission (FTC) and the Antitrust Division of the Department of Justice (DOJ) of a proposed transaction and comply with a mandatory waiting period before the transaction can be consummated. HSR Thresholds Raised. Generally, a transaction will not be reportable under the new thresholds unless it is valued for HSR purposes at more than $90 million. If the value of the proposed transaction is greater than $90 million but less than $359.9 million, the transaction will not be reportable unless the “ultimate parents” of the acquiring and the acquired firms also meet a certain minimum “size-of-person” test—in most instances, where one parent (including all entities it controls) has net sales or total assets of at least $18 million and the other has net sales or total assets of at least $180 million. Where the jurisdictional tests are met, the transactions are reportable unless an exemption applies. 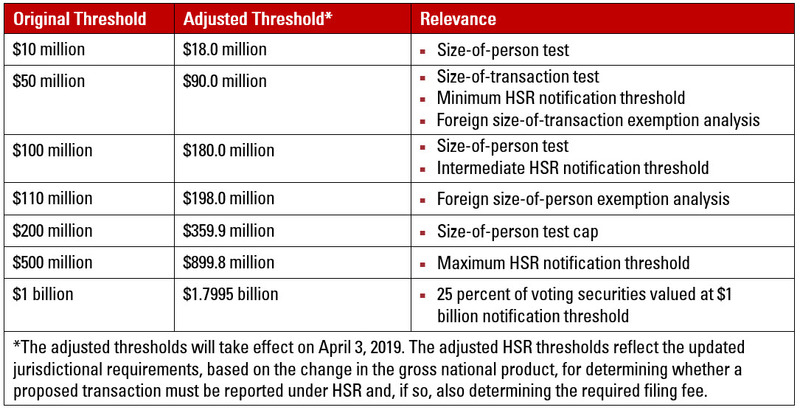 The table below includes the original and the newly adjusted figures for each relevant HSR threshold (the original figure continues to appear in HSR regulations with the words “as adjusted” to remind the reader that the thresholds are adjusted each year). Parties should be mindful that there are many other factors that impact whether a given transaction is subject to the jurisdictional thresholds in addition to these dollar thresholds. $45,000 - Transactions valued in excess of $90.0 million but less than $180.0 million. $125,000 - Transactions valued at or greater than $180.0 million but less than $899.8 million. $280,000 - Transactions valued at $899.8 million or more. HSR Violations. Effective February 14, 2019, the maximum civil penalty for HSR Act violations increased from $41,484 to $42,530 per day. The new daily maximum civil penalty applies only to penalties assessed after that effective date, including those penalties whose associated violation predated February 14, 2019. Revised Thresholds for Interlocking Directorates. Section 8 of the Clayton Act generally prohibits companies that compete with each other from having interlocking memberships on their corporate boards of directors. The FTC annually revises the jurisdictional thresholds that trigger the interlocking directorate prohibition. The changes to the thresholds are based on the change in the gross national product and are effective immediately. Section 8(a)(1) of the Clayton Act prohibits a person from serving as a director or board-elected or board-appointed officer of two or more corporations if the combined capital, surplus, and undivided profits of each of the corporations exceeds $36,564,000. Section 8(a)(2)(A) of the Clayton Act exempts interlocks for which the competitive sales of either corporation are less than $3,656,400.